Boiledbeans » Impossible to imagine a version of this on my wrist.. Impossible to imagine a version of this on my wrist..
BTW, same advantage with Arabic as with Russian. 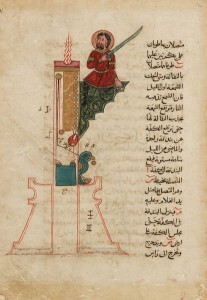 Candle Clock designed by Al Jazari in 12th Century. Nice. candle clock by al jazari.